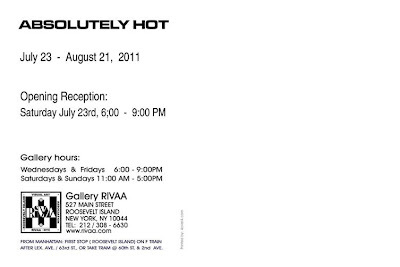 The title of the Exhibition, Absolutely Hot, is certainly an accurate description of our recent weather. 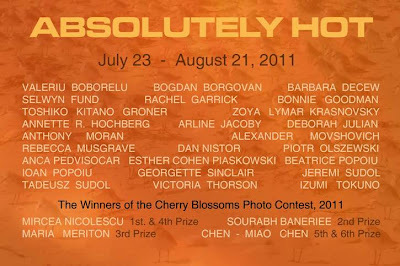 If you are around later this evening, come to the opening reception, enjoy the art and meet some of your neighbors. 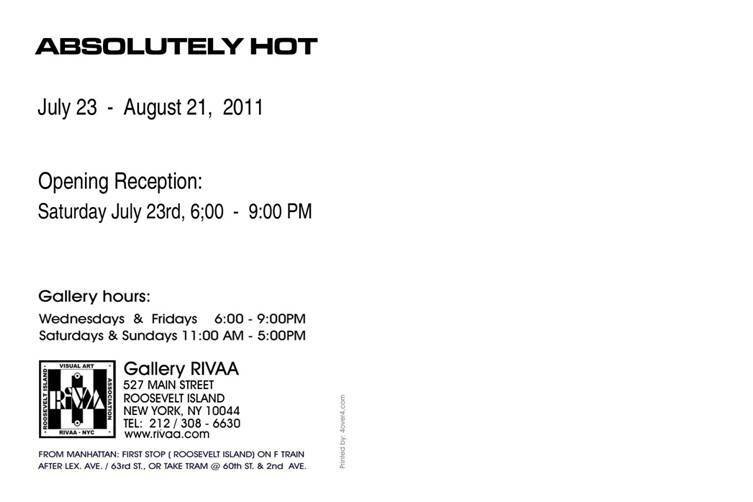 Hopefully, the gallery will be air conditioned. Roosevelt Island Title of New Song From Eleanor Friedberger's New Solo Album Last Summer - Music Video On Tram, Anybody Look Familiar? Eleanor Friedburger of the Fiery Furnaces recently released a solo album called Last Summer and the title of one of the songs is Roosevelt Island. Here's the video for Roosevelt Island by Ms. Friedburger. Eleanor Friedberger - Roosevelt Island from Merge Records on Vimeo. "Roosevelt Island," the second video from the first solo album by Fiery Furnaces frontwoman Eleanor Friedberger is charmingly straightforward, with the singer taking the tram to the island referenced in the song, which lies just off the coast of Manhattan. The laid back tune calls back to mid-Seventies hits by Steely Dan and Fleetwood Mac, but Friedberger's distinct vocal style lends the music a very different sort of energy. All through the video, she scribbles in a journal, which is a perfect image corresponding with her vocals, which sound like ideas spilling directly out of her brain and on to the tape. Ms. Friedberger will be playing in New York on August 22-23 at Webster Hall. Perhaps she would like to come back and perform Roosevelt Island right here? The Weather is forecasted to hit a whopping 101°. But there are ways to beat the heat and stay cool. Roosevelt Island Operating Corporation has established temporary cooling centers at 2 locations on the island. You can find air conditioned shelter and ice cold water at the Senior Center at 546 Main Street and Good Shepherd Community Center at 543 Main Street. It's really, really, really hot out there today so take precautions. The summer is at a boiling, do you need a way to escape the heat? 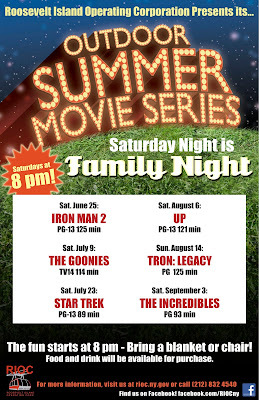 12 - 1:30PM, 3:30 - 4:30PM and 7:30 - 10:30PM. The pool will also be FREE tomorrow July 23, 2011 from 12 - 9PM! 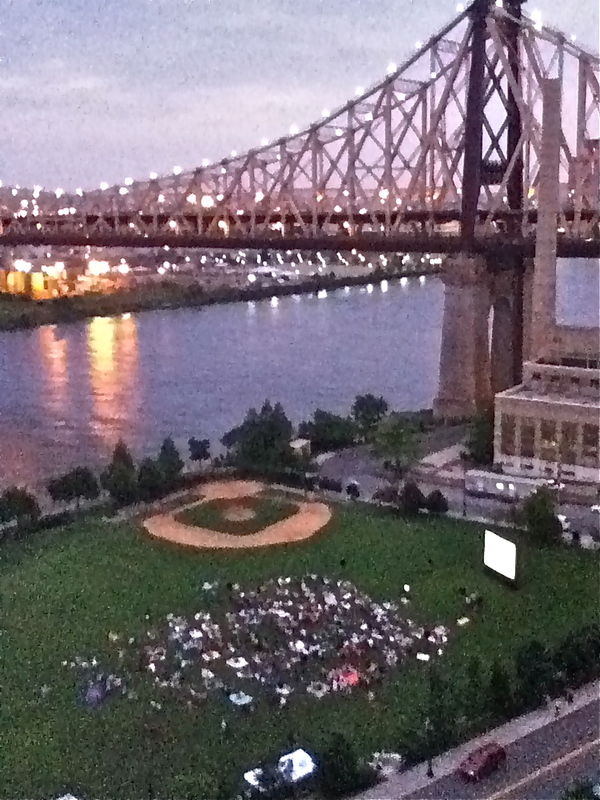 Outdoor Summer Movies are back this Saturday evening at Roosevelt Island's Firefighter's Field. 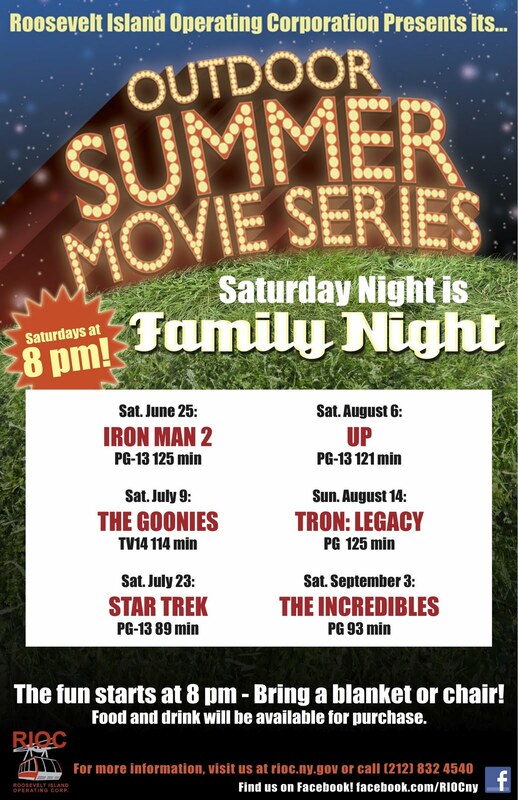 Come join the crew of the Space Ship Enterprise for a fun evening at Roosevelt Island's Firefighter's Field. Here's the final landing of the Space Shuttle Atlantis from NASA TV. While walking past the Meditation Steps last night, I noticed what appeared to be brightly colored lights spinning in the air over the East River by Roosevelt Island's West Waterfront Promenade. 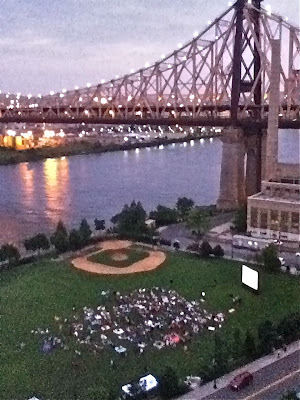 Here's an example of Roosevelt Island Hooping at the Meditation Steps from last night. More on Hooping here and here. ... Normally people move to the suburbs, but people are tending to stay,” said Gary Alterman, a senior vice president at RKF. Between 2000 and 2006, according to the New York Times, Manhattan’s five-and-under crowd increased by over 32%, and has only continued to boom. ... Brooklyn is a hot place,” said Alterman. But children’s stores are popping up in emerging neighborhoods citywide. Giggle, an upscale clothier with outposts in SoHo and upper Manhattan, is scouting sites in Long Island City, where a handful of luxury towers have attracted families in recent years. Read the whole Real Estate Weekly article here. What's the latest on the Roosevelt Island Main Street Master Leaseholder? Prior to the start of the meeting, I asked the RIOC Directors and Staff present whether it was still their intent to conduct the discussion on the Master Leaseholder and Island House Privatization in Executive Session closed to the public. They said that it was. As the meeting began, it was announced that RIOC Board member Howard Polivy would be the new Real Estate Committee member and Mr. Polivy was then elected to be the Real Estate Committee's Chairperson. At that point I expected to be asked to leave the room so that the Committee could go into Executive Session as planned. 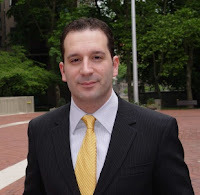 To my surprise, Mr. Polivy indicated that he would like, as far as possible, to have a discussion on the Main Street Master Lease and Island House privatization in public so that the Roosevelt Island community could have some idea as to what was going on. RIOC President Leslie Torres then gave a brief recap of the Master Leaseholder status, indicating that there had been no change to the basic plan, just about every issue has been resolved and that the lease should be ready for signing within a few more weeks. Ms. Torres noted there had been some delay's with the attorneys involved and that discussions were still ongoing regarding Hudson/Related's responsibilities to existing leaseholders. Good job by Mr. Polivy on his first day as Real Estate Chair in trying to keep the public informed as to what is going on. An audio webcast of the Real Estate Committee Meeting's Public Session should be available soon, usually withing two days of the meeting, although at the time of this post, it is not yet on the RIOC web site. Fear and Loathing In Las Vegas By Hunter S. Thompson Subject of Book Club Discussion At Roosevelt Island Public Library Tonight - It's Time For A Road Trip! More information available at the Roosevelt Island Public Library web site. Here's the trailer from the movie. More on Roosevelt Island fishing from previous posts and East River Urban Fishing. Open Building Lobby Doors A Continuing Security Problem For Roosevelt Island's Roosevelt Landings Buildings - Will Issue Be Addressed By Landlord Urban American? 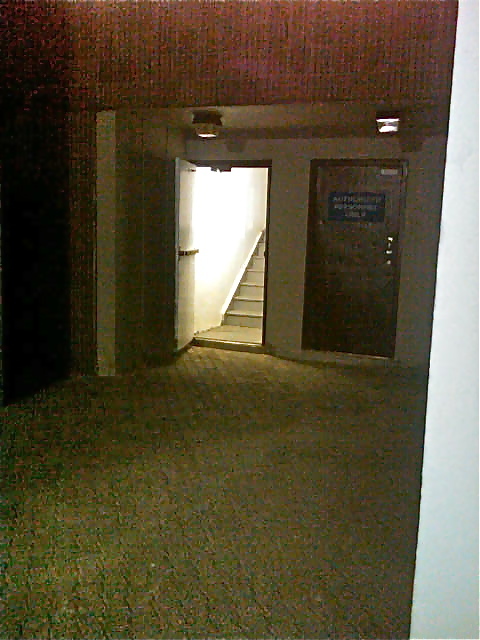 Again last evening, although we'd discussed this problem in our meeting last Thursday, I found the lobby's doors at 546 Main Street, (the Senior's building)- both front and rear, were open at approximately 8:45 PM. 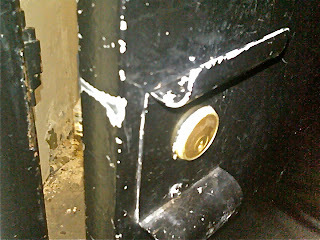 The front door continues not to close automatically, and the back door lock is broken and will not adequately secure the door. I had placed signs on these doors so that tenants would know to secure the doors behind them, and those signs were removed. No security was assigned to guard the doors. I reported the problem to the Public Safety Dept. 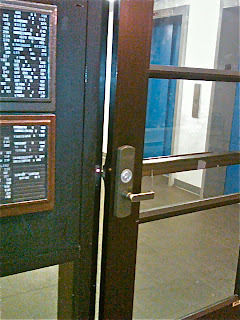 More examples of open Roosevelt Landings doors. 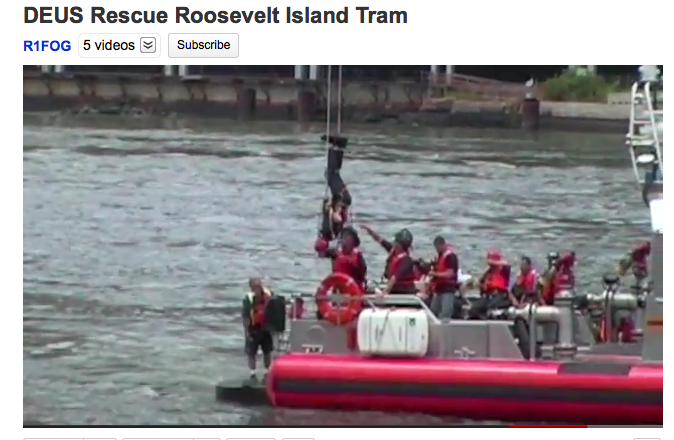 Roosevelt Island Tram Rescue Drills Performed Today by NYPD - Will There Be Joint Command Drills With FDNY and Other Emergency Responders As Well? Last week the New York City Fire Department conducted Roosevelt Island Tram Rescue Drills as shown in the video below from R1FOG. Members of the FDNY Special Operations Command drill at the Roosevelt Island Tram. The tram connects Manhattan and the island across the East River. The highest point is 250-feet above the river. The last descent from the tram car to the fireboat stationed below featured the DEUS 7300 back-up belay. The firefighter inverts several times including a head-first touchdown on the fireboat! As a reminder the NYPD will be practicing on one Tram cabin, today Wednesday, July 20th, from the hours of 10:00 a.m. to 2:00 p.m.
Why do the NYPD and FDNY conduct Tram rescue drills separately? My understanding is that in the event of an emergency regarding the Tram, a joint command operation is initiated by NYPD,FDNY, EMS and RIOC. I have seen NYPD and now FDNY conduct Tram rescue drills separately but have not seen them practice together. Will there be joint tram rescue drills by all Emergency responders for the Tram? It is my understanding that interservice rivalry among the Emergency Responders was a problem when passengers were stuck in the old Tram over the East River throughout the night before they were finally rescued several years ago. RIOC has an MOU with NYPD, FDNY, and OEM. The MOU establishes a "Joint Command" for Tram exercises, including emergency evacuation procedures. The exercises are typically held in the Spring and Fall. In the event of an actual emergency, the Joint Command will be implemented. The NYPD and FDNY have individually requested additional practices in order to become more familiar with the Tram and utilize new equipment. A MOU is a Memorandum of Understanding. During recent conversations with NYPD and FDNY officials, they deny that any inter-service rivalry between them contributed to delays in rescuing those Tram passengers stuck above the East River overnight in April 2006. These officials describe such reports as incorrect and exaggerated by the Press. Here's more from previous post on the issue of NYPD - FDNY inter-service rivalry in regard to the April 2006 Roosevelt Island Tram incident. ... This morning, we released a Request for Proposals to universities near and far. Our offer is straightforward: We will provide prime New York City real estate - at virtually no cost, plus up to $100 million in infrastructure upgrades, in exchange for a university's commitment to build or expand a world-class science and engineering campus here in our city. We are offering sites at three possible locations, all of them under-utilized, and all of them overflowing with potential: Governors Island; the Navy Yard; and Roosevelt Island. "This is not the first time government has offered land and funding in exchange for university development. Governments around the world are not only offering American universities land - they are offering to pick up all capital and operating costs associated with an expansion on their soil. They recognize how important universities are to economic growth - because they have seen it happen here in America. Mayor Bloomberg's full prepared remarks for the Crains Conference are here. Stanford University, one of the interested schools, has already made it clear that they want to develop a world class science and engineering campus right here on Roosevelt Island. 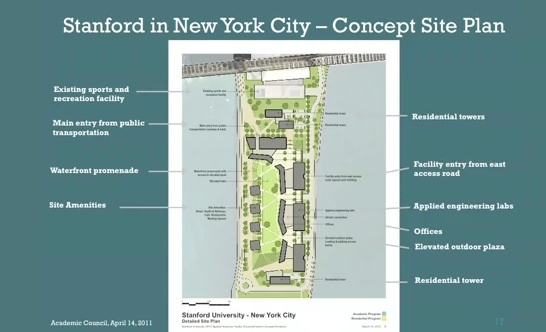 Here's a video of Stanford's Plan for a Roosevelt Island Campus. Why does Stanford like Roosevelt Island as a site for it's New York City Campus? Mayor Michael R. Bloomberg, Deputy Mayor for Economic Development Robert K. Steel and New York City Economic Development Corporation President Seth W. Pinsky today announced the City has issued a Request for Proposals (RFP) for Applied Sciences NYC, the City’s initiative to build or expand a state-of-the-art engineering and applied sciences campus in New York City. The RFP is the next step in the initiative – unveiled in December 2010 – that seeks a university, institution or consortium to develop and operate a new or expanded campus in the City in exchange for access to City-owned land – at the Navy Hospital Campus at the Brooklyn Navy Yard, the Goldwater Hospital Campus on Roosevelt Island, or on Governors Island – and the full support and partnership of the Bloomberg Administration. The City is also prepared to make a significant investment in site infrastructure, offering up to $100 million in a competitive process designed to select the proposal that yields the most benefit to the City for the lowest commitment of City resources. The City expects that any public contribution will be matched several times over by resources raised by the winner or winners themselves. Applied Sciences NYC will be a critical driver of the further diversification of New York City’s economy, generating billions of dollars in economic activity, spinning off hundreds of new companies, and creating nearly 30,000 jobs, according to an economic impact analysis. Responses to the RFP will be due in the fall and a winner will be selected by the end of 2011. The opening of the first phase of the project is anticipated for 2015. Mayor Bloomberg made the announcement today in a keynote address at the Crain’s New York Business 2011 Future of New York City conference in Manhattan. ... 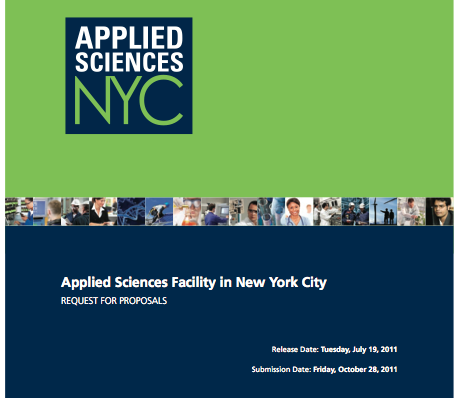 The Applied Sciences NYC initiative was launched at the end of 2010, with the issuance by NYCEDC of a Request for Expressions of Interest (RFEI) that received 18 responses from 27 top-tier institutions around the world. The RFEI responses contained proposals for hundreds of millions of dollars in private investment and significant increases to the number of applied sciences and engineering graduate students expected to be produced in New York City. They also included a variety of ideas about what types of science the City should be focusing on, ranging from environmental sciences to nano-engineering. Many of the proposals included wet and dry labs as well as space for teaching, housing, and recreation. 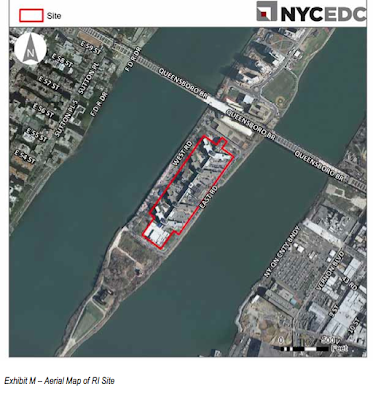 The proposals indicated primary interest in the Brooklyn Navy Yard site, the Roosevelt Island site, and the site on Governors Island, as well as a number of privately-owned sites. Here is the full press release and entire copy of the Applied Sciences NYC Request For Proposals. The section of the RFP describing the Roosevelt Island Goldwater Hospital site begins on page 50. Can you imagine how Stanford, or any other University's presence might change Roosevelt Island? More information available from previous posts. Democracy is fragile. As the son of an immigrant who was born in the Dominican Republic and lived under a dictator part of her life, I am reminded of this all the time. The things we take for granted, like voting for our leaders and being able to openly disagree with them and sometimes influence their decisions, is a gift that we miss only when we start to lose it. Over the past couple of years, I have tried to take the lead on many of the issues that have plagued Roosevelt Island for most of the time we have been here. I took them on because they were difficult. My strong fellow board members followed me into uncharted territory and with little promise of success. Together, we moved forward to reform the way our government and Island worked, with the hope of making this a better place to live. Affordable housing and privatization is probably the most complex issue that we face on the Island. Due to a constant shift in leadership and administrations, and the loaded nature of the issue, it starts and stops and is never completed. During my tenure as the chair of the Real Estate Advisory Committee, I tried to get the dialogue going between the agencies involved, any questions resolved, and, most importantly, moving forward to completion. I started by setting up a meeting at City Hall with every agency involved, to share documents and resolve any issues going forward. Since the board had never passed a resolution in favor of DHCR’s affordable housing plans, I put that on the agenda and we passed it as a commitment to moving forward in favor of long-term affordability for all Mitchell-Lama buildings. The end result is that the board has passed a lease extension that ensures long-term affordability for Rivercross and, most recently, moved forward in committee with the DHCR affordability plan for Island House. It pleases me that these milestones have been achieved, and I have confidence that our board will make sure that the last portion of this work is completed. I’m proud of our commitment to affordability, and that our resolution and work led to real results. Main Street retail has been a problem for years, and it was one of the first things I tried to work on as a resident and then as a board member. The Retail Master Lease is proof that an idea can come from a resident and be approved by the Residents Association, move to the board, and become a solution that is mutually beneficial for the government and private business. It secures the present revenue stream for RIOC and shares profits above that, benefits the community with a competitive and vibrant retail environment, and takes government (and the long and onerous RFP process that goes with it) out of the business of retail management for the Island. There will also be significant investment in the spaces to make them look great for tenants and for the community. However, to be especially successful, I recommend that you go to your favorite off-Island stores and restaurants, and tell them that Roosevelt Island is finally ready to rent stores. The more of you who reach out to entrepreneurs and businesses that you love and bring them to the Island, the better the choices we will have in the future. This plan will not only bring jobs and money into our economy, but Hudson-Related has significant retail experience, and the success of Main Street Retail helps promote the completion of the final buildings of Southtown. That will bring significant revenue for RIOC, which can help secure our promise of long-term affordability for the buildings in Northtown and help pay for our infrastructure and operational needs going forward. Transportation on this Island has always had a dependability problem, and now it appears to be turning a corner. During my term as chair of the Operations Committee, we installed the Nextbus bus-tracking system, and a consistent schedule. Islanders have developed mobile apps to track the Red Bus Nextbus system, and many of these mobile apps will soon be posted with download instructions and websites at each bus stop. I had RIOC staff and myself meet at Google Headquarters to work on maps and screens at each bus stop so you can see when the next Red Bus is arriving even if you don’t own a mobile device. I’ve secured funding for electric-car charging stations for Motorgate, so we can get around greener on the Island. Verdant Power is working with the Island to power this with Tidal Energy. This, coupled with our new transportation manager, should make our transportation system more reliable around the Island. It will take time to get it right, but the foundation is in place to make it work. Parking enforcement and availability will begin to improve with our smart-parking sensor system, which will hopefully be deployed throughout the Island. This, coupled with lower short-term parking prices at Motorgate, will make sure that people use short-term parking for its intended purpose – to drop off and pick up without double-parking. Public Safety officers are being trained with iPhones so that they can handle violations indicated by the sensors while focusing on keeping the Island safe. Improved parking systems will also make sure our new and improved retail corridor has the ample parking spaces that merchants need to thrive. Less double-parking and additional enforcement of parking rules will make sure that the Red Bus can keep on schedule. Also, a mobile app and street signage will indicate if there is parking available ahead, and allow payment so you don’t have to circle the Island. Many of these suggestions and issues have been brought up on RIOC’s new RI311 issue-tracking system that is being tested. It is powered by the citizen-311 system SeeClickFix.com. It will soon be on the RIOC website, and it will help the community indicate the issues on the Island and vote up, comment, and take photos of these issues. When issues are resolved, everyone who indicated an interest will get an email notification that it has been closed. I’m excited to start the next chapter of my life on Roosevelt Island by working on a team that will negotiate a community-benefit agreement with the new university planned for the southern end of Roosevelt Island. I believe this is a unique moment to work on a number of infrastructure improvements, like green affordable energy for everyone on Roosevelt Island, and an extension of the free Island-wide wi-fi Internet plan like the one that I worked on with Verizon and is being completed for Southpoint Park. Ferry service may prove feasible with university help, and a dock study is currently being completed. Ideas like a science school, scholarships for local students, and an advanced library will be negotiated to make sure that this university and Roosevelt Island mutually benefit from our relationship. Community input and an independent elected board led to these improvements and ensure that they will continue. Ideas like Tram straps and a more stable ride, better stores, and other suggestions that led to a better Island came from the grassroots level. It is that commitment to the community that is threatened each time an unelected board member takes a seat. It unravels the fabric of our community, and despite the best intentions, it is a blow to our democracy and independence. Roosevelt Island is the embodiment of the American Dream, and no part of that dream should be compromised. Don’t let it happen. The reason for Mr. Kalkin no longer being on the RIOC Board is discussed fully at previous post. I received a report late yesterday afternoon of a person floating in the East River. While walking south just past the Queensboro Bridge to investigate, I saw FDNY and NYPD Harbor Patrol Boats arriving on the scene along with a hovering helicopter. What happened? It turns out that this small boat experienced engine trouble and was drifting towards the rocks on the east side of Roosevelt Island. Soon after the arrival of the rescue boats, the engine started, the boat went on it's way and all was well again. Here's how the incident was reported by the Roosevelt Island Public Safety Department. Possible Floater/Drowning - FDNY and NYPD responded. Condition was unfounded. Vessel In Distress - FDNY and NYPD responded. NYPD towed vessel. A previous post from 2009 reported on the water rescue by Roosevelt Island Public Safety Department and NYPD Harbor Patrol of a man who jumped into the East River and got sucked underneath the Subway Pier. As you may or may not know, there have been a few burglaries on the island. These have not been reported with forced entry. Folks are leaving their front doors unlocked (when they leave, and even when they are home). This campaign is intended to remind everyone that although this community is extremely safe, this is still New York City and folks should keep their doors locked. These flyers will be distributed throughout the island. Your support in spreading the message is most appreciated. If you notice your neighbor leaving without locking their door, please tell them. 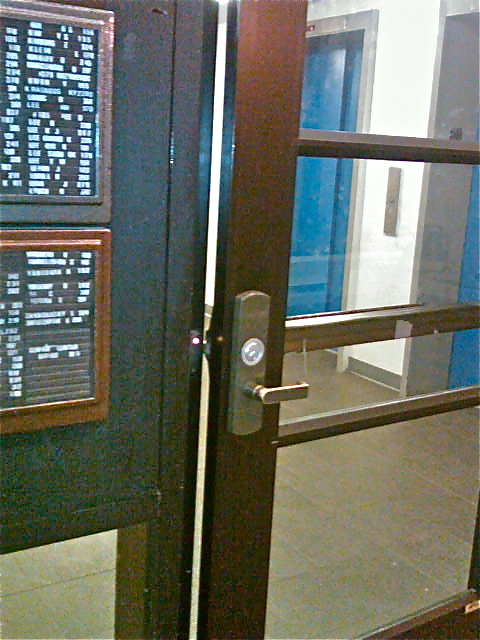 Not only do Roosevelt Island residents need to keep their apartment doors closed and locked but Urban American management at Roosevelt Landings (formerly Eastwood) also needs to keep the front and back building lobby doors closed and locked in order to prevent unauthorized entry. I made the rounds to check Roosevelt Landings doors late last night. Even though I had made abundant prior reports to Public Safety, (which I am told are distributed to Urban American), and even though we spoke about the importance of locking all the doors in our meeting on Thursday and I had pointed out to you that both the 546 front door and the 546 door to the rear of the lobby needed to be addressed, both of these doors were in the same state we had discussed. 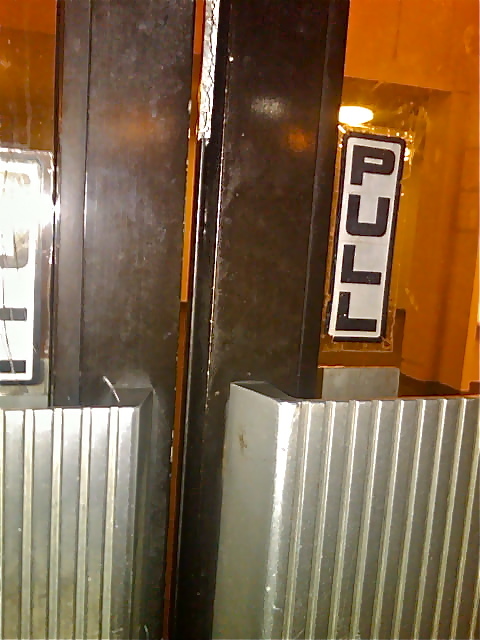 Both were ajar and no one was posted at the doors to secure them even though neither of them will adequately close automatically. I watched as the Main Street entrance was used 3 times, and in each occassion, the door failed to close behind the person who used it in normal fashion. I have placed a notice on both these doors to tell people who use them that they should take the added security measure to close the doors behind them. You should be aware that even closing and locking the rear door will not secure it. It is easily opened even when locked. PLEASE, for the sake of the safety of our residents, DO NOT REMOVE THESE SIGNS until both of these doors are secured either by stationing someone to guard them until they are repaired, or by repairing them. 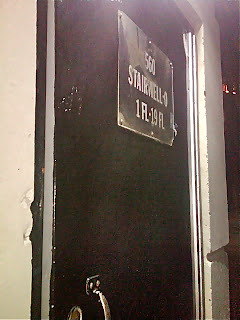 URGENT REPAIR of these doors is imperative! Seven burglaries were reported in Roosevelt Landings over the past (aproximately) 6 months.... In addition a shooting took place as well as a number of fights. 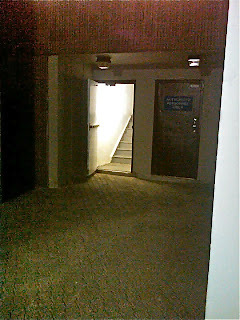 It is imperative that the landlord lock the doors to the building and that tenants lock the doors to their apartments. The apartment lock that is best to use is the dead bolt.... the one that slides into the door frame and is fastened by either a key from the outside or by turning the small knob that is directly above the doorknob on the inside of the door. If a tenant is missing their dead bolt or if it does not operate properly, they should contact the landlord for service! 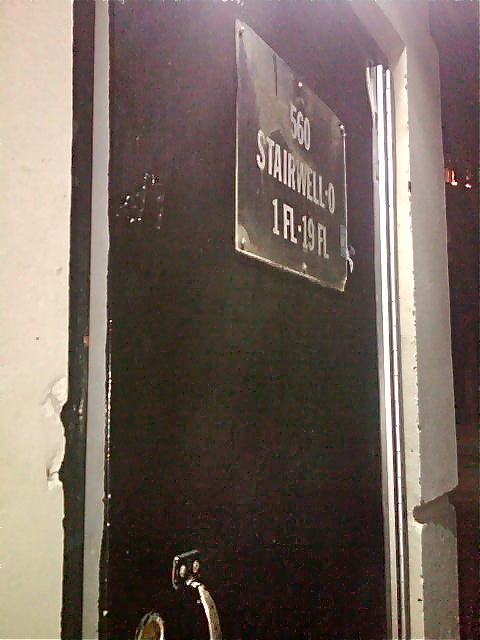 Several Roosevelt Landing exterior doors have been found ajar with great frequency. These doors have been brought to the attention of the landlord on several occasions, We've asked the landlord to post security at doors that are experiencing problems. They have yet to do so, therefore, we are requesting that whenever a tenant exists a door, they make sure the door closes and locks behind them. Additionally, no tenant or maintenance worker should prop a door open for any reason. When tenants notice open or unlocked doors they should report the problem to management, PSD, and if no response, to 311. The Roosevelt Landings Residents Association has been vigilant about checking external building doors and reporting their state of repair to the Public Safety Dept. and management. The safety of our tenants is our primary concern. We believe that the manpower and policies needed to keep our tenants safe are in need of review, modification and enhancement. In the interim, we encourage all adults who are concerned about this issue to donate a small amount of time to a building "watch" program. All who wish to volunteer, please contact jmincheff@gmail.com immediately. The safety of your family and friends could depend on your support! More on security at Roosevelt Landings from this previous post. New York City To Release Blueprint and Request For Proposals On State Of The Art Applied Sciences and Engineering School This Week - Is Roosevelt Island One Step Closer To Becoming Sillicon Island? Will Roosevelt Island follow in the footsteps of San Francisco's Bay area Silicon Valley to become New York City's Silicon Island? How about the next Sergey Brin and Larry Page starting the new Google from right here on Roosevelt Island? Is that possible? Well, hold on to your hats because it may very well happen sometime in the not too distant future. Here's a video of Stanford's Plan for Roosevelt Island Campus. What's the latest news on proposed plan to construct a state-of-the-art Applied Sciences and Engineering School in New York City and perhaps build it on Roosevelt Island ? We've been waiting for the issuance of the Request For Proposals by New York City which had originally been planned for June 2011 and it looks like that will happen this week. Mayor Michael Bloomberg will convene a private breakfast meeting of business and civic leaders Tuesday at Google’s Manhattan headquarters to present the city’s blueprint for the future tech campus, first announced late last year. Read the entire City Hall News article here. 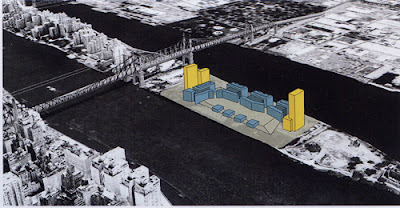 More information on Roosevelt Island as the potential site for Stanford University or another first class Applied Sciences and Engineering school from previous posts. Why These Traffic Bollards On Queens Side of Roosevelt Island Bridge? What are these weird bollards at the Queens side of the RI Bridge? ...Each year thousands of pedestrians are injured and hundreds are killed by motorists on New York City streets. As the population of the City increases, and especially as the number of senior citizens increases, there is no better time to implement basic engineering improvements that are proven to calm traffic and prevent crashes. While it may not be possible to put bollards on every block, there are many sensible places that could become standard locations to install them. Areas with high pedestrian volumes, high crash locations, high populations of senior citizens and along bus and truck routes should be prioritized. As reported in this May 3, 2011 post, according to Streetsblog the Department of Transportation (DOT) is trying to make crossing 36th Avenue at the Roosevelt Island Bridge safer with pedestrian safety Islands but no information on the bollards. 1. Enhancement of pedestrian crosswalks at the intersection. For going north through Hells Gate, I usually start 1-2 hours AFTER low tide at the battery to ride the SLACK water across the 'gate'. Leaving the battery 1-2 hours 'after' the low (at the battery), you will have only slight to moderate current against you as you travel northward up the East River but the tide/soon will soon change and 'release' you northwards through the 'gate'. This will keep you moving instead of 'circling around' and become a hazard to the sometimes large amount of commercial traffic already 'stacking up' to wait to get through the 'gate' at SLACK water. Here's an example from a few days ago of the commercial and recreational boating traffic sharing the East River just off Roosevelt Island's Subway Pier.